Heat oven to 450°F. Spray cookie sheet with cooking spray. Unroll pie crust on cookie sheet. In medium bowl, mix 1/2 cup granulated sugar, the cornstarch and cinnamon. Gently stir in apples. Spoon onto center of crust, spreading to within 2 inches of edge. Fold edge of crust over filling, ruffling decoratively. Brush crust edge with milk; sprinkle with 1 teaspoon granulated sugar. Bake 25 to 30 minutes or until crust is golden brown and apples are tender, covering with foil last 10 minutes if necessary to prevent excessive browning. Meanwhile, in 1-quart saucepan, melt butter over medium heat. Stir in brown sugar and corn syrup; heat to boiling. Reduce heat. Boil gently 2 minutes. Add pecans. Boil 2 to 3 minutes, stirring occasionally, until pecans are lightly toasted. Remove from heat. Stir in whipping cream and vanilla. Cool 15 minutes. 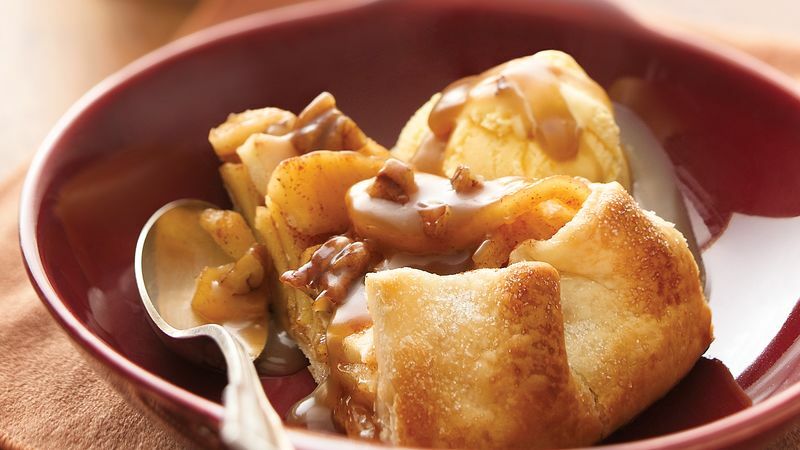 Serve over warm or cool pie. Plate like the pros! Drizzle a thin line of sauce back and forth on the plate before adding a slice of pie. Drizzle top of pie slice with more sauce before serving.